In Zone 8, late winter is when most Rosemary plants start their incredible bloom. 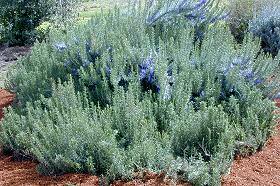 The Pine Scented Rosemary above is just starting and will be covered in blue in a short period of time. The flowering lasts until late April. Bees love Rosemary and add life to a winter garden. Pine Scented Rosemary (on the left) shows its feathery character when positioned next to White Thin Leaf Rosemary. 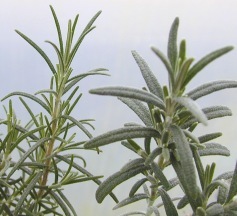 This wispy leaf makes Pine Scented Rosemary ideal for using fresh in any recipe using Rosemary. It makes a great addition to our Gourmet Herb Garden Six Pack. This plant is often available in plug trays. These trays hold 128 of all the same plant. They are a great low cost way to fill a lot of space. Each cell is 3/4 of inch by an inch. Check here to see if Pine Scented Rosemary Plug Trays are available.